We recently refinished a beautiful antique oak teacher’s desk for our library. It was so great to finally get that melamine desk and purple wash stand out of our library/office. I didn’t want to spend much time on this project as I didn’t really have a plan or destination for it. What I did know was that although I love purple, it currently has no place in my home. 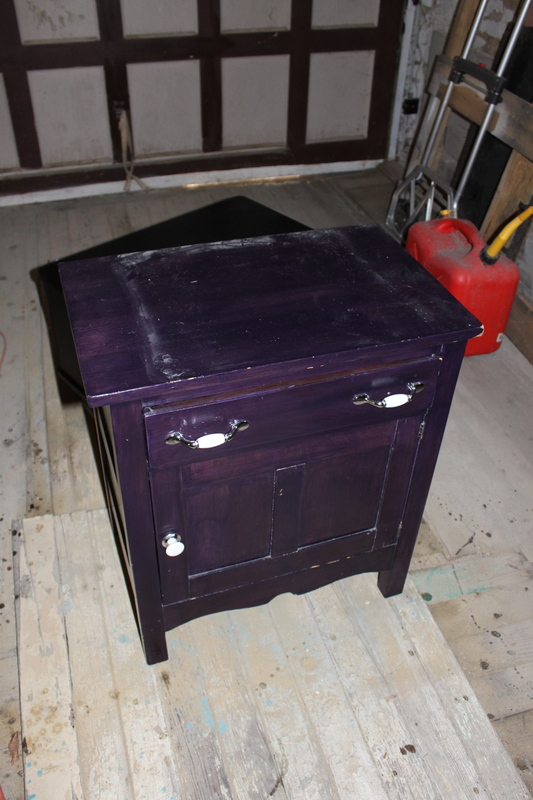 The camera flash makes this purple wash stand look extra bright. This is a before shot of our library with the stand and old desk. 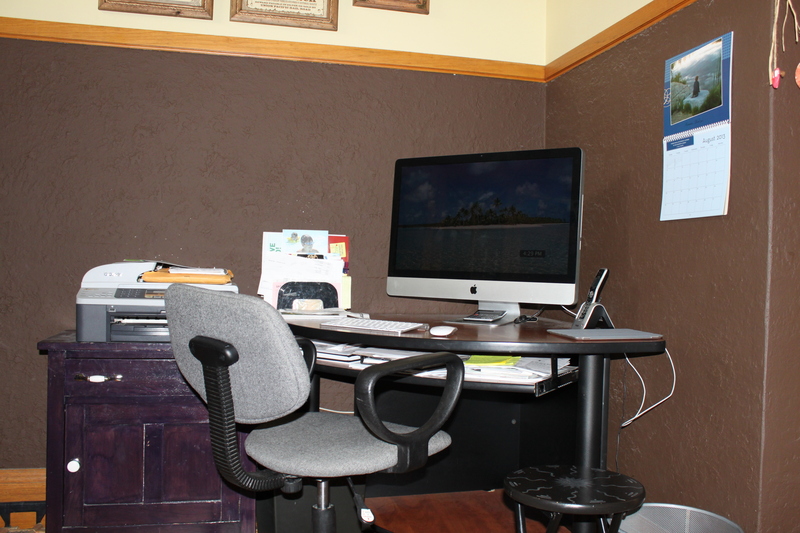 Hmmm….you can still see the dust from around where my printer used to sit. That’s revealing isn’t it? One of the things I hated most about this cabinet was the handles. What was I thinking when I stained it purple (about 15 years ago) and chose those handles? 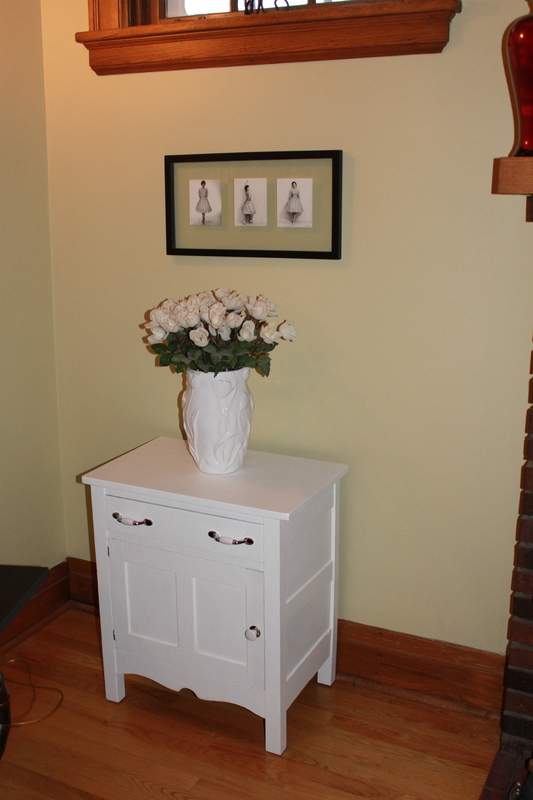 I simply painted the cabinet with two coats of paint and added shelf liner. I decided to give the old handles a try and didn’t find them nearly as offensive with the white on white look. I am not sure if this is where it will stay, but currently it has been placed in my living room next to the fireplace. Posted on August 29, 2013 by Cindy Roy •	This entry was posted in DIY and Upcycling and tagged antique wash stand, antique washstand, DIY, painted furniture, upcycling furniture, wash stand, washstand. Bookmark the permalink.